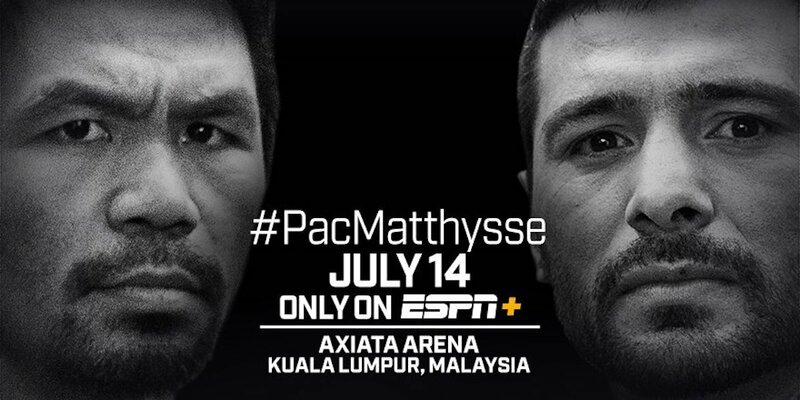 A new and improved Manny Pacquiao found the fabled Fountain of Youth on Saturday night in destroying WBA World welterweight champion Lucas Matthysse by a 7th round knockout at the Axiata Arena in Kuala Lumpur, Malaysia. The fight was streamed on ESPN+. The victory by Pacquiao showed that he can still compete against the best in the welterweight division. Pacquiao was without his trainer Freddie Roach tonight for the first time in years. Pacquiao looked great with trainer Buboy Fernandez guiding him. Pacquiao knocked the hapless over-the-hill Matthysse down three times in the fight before referee Kenny Bayless stopped the fight in round 7. The official time of the ending of the contest was at 2:43. Matthysse looked totally over-matched from the speed and power of Pacquiao. Matthysse was too slow to contend with the speed of Pacquiao. Matthysse looked like he quit in spitting out his mouthpiece after being dropped in round 7. In battering Matthysse to pieces, Pacquiao, 39, showed that he’s not over-the-hill like many boxing fans and media members believed going into tonight’s contest. In Pacquiao’s last fight, he was beaten by Australian Jeff Horn by a 12 round unanimous decision last year in July in Brisbane, Australia. Pacquiao looked shot in that fight, but that was a good opponent. Tonight, Pacquiao was facing older fighter in Matthysse, and that made his job a lot easier. Pacquiao’s knockout of Matthysse was his first since 2009. The last time Pacquiao knocked out an opponent was against Miguel Cotto. The way Pacquiao fought tonight, he would have knocked a lot of guys out in the welterweight division. I’m not sure that Pacquiao could knockout Terence Crawford or Errol Spence, but he would be a real threat to Amir Khan, Keith Thurman, Danny Garcia and Shawn Porter. After the fight, Pacquiao wasn’t ready to say whose next for him to fight. He says he wants to think it over before he makes a decision. He says he does want to come back and fight before the end of the year. Pacquiao is still one of the best in boxing, but we don’t know if he could compete against the very best in the division. Matthysse was technically a world champion at 147, but he’s not in the same class as Thurman, Spence, Shawn Porter, Terence Crawford and Danny Garcia. The victory for Pacquiao gives him the WBA regular welterweight title. The title is less important than beating a top level fighter in Matthysse. Just beating Matthysse was enough for Pacquiao to show the boxing fans that he’s still relevant and can still fight.